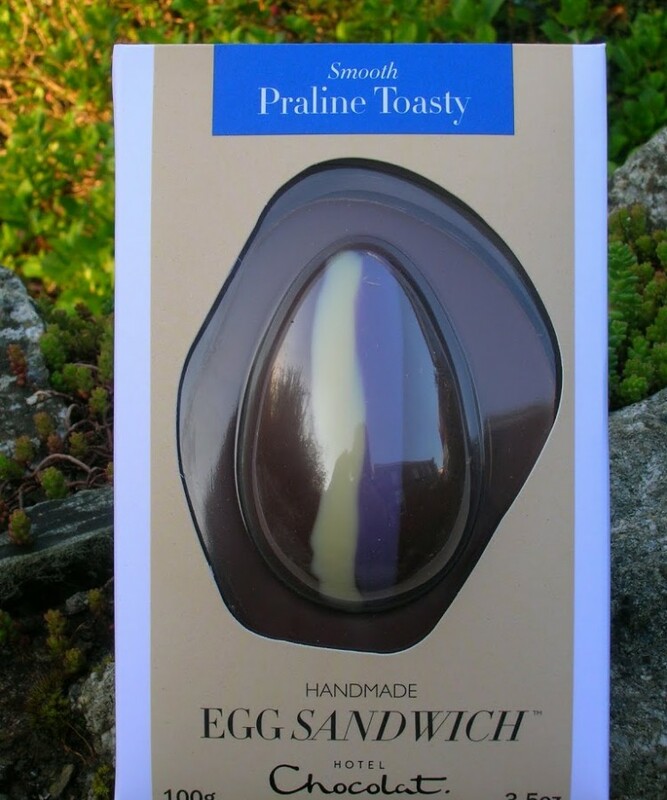 Beth of Jam & Cream PR has been strutting her stuff again and thanks to her efforts, I was recently sent this rather cute 100g Praline Toasty egg sandwich from Hotel Chocolat. This is not the usual sort of thing I have for breakfast, but is more than acceptable later in the day. Needless to say, this egg sandwich was not your traditional fried egg with a bit of tomato sauce slapped between two slices of bread, no, it was two slabs of chocolate sandwiched between a praline chocolate egg – a fun and novel concept. The slabs of chocolate turned out to be more than I had bargained for. They were in fact half Hotel Chocolat’s house 40% milk chocolate and half praline chocolate which was particularly delicious. The chocolate was smooth and creamy and the white chocolate streak down the middle of the egg gave another dimension to its flavour. I was expecting the egg to be filled with praline, but actually it was hollow – it was almost a relief as the hazelnutty praline was quite rich and sweet. – just about the right volume for two people to share after a hard day’s labouring. Hotel Chocolat are currently looking for help in naming their new Easter Baby. If you’d like to help them out and be in with a chance of winning £75 worth of chocolate then go to the following link on facebook and have a go at Name our bouncing Easter baby. I can’t wait for Easter!! Brittany – thank you. I rather wish I had a few more of them stashed away somewhere. MCB – I am so not organised for Easter – can’t believe it’s only a few days away! Those of us on Beth’s list have been so fortunate to get to taste all this chocolate, I’ve stashed a few of my choccies for the weekend. You were lucky then Janice – I only got this egg. Oh yes, very lucky then. I had a big egg to review last month and did a giveway, and the little ‘egg & soldiers’ this month for the Bouncing Baby promo. I have stashed most of that. Linking the image, I did that myself, by highlighting the image then goign to the ‘link’ icon, then you get a pop up box which I linked to the FB page with the competition. Hope that makes sense, I’m better at showing people than explaining! I had already chosen and informed boyfriend of the egg i wanted (cheeky I know) But now ive changed my mind! want! Now that is something definitely different and SO worth a try! What a great time of year, eh? This is downright brilliant. mmm I love Hotel Chocolat, simply delicious! Christmas is over and Easter will soon be here! Will have to look at Hotel Chocolat eggs this year.